As a cherished Southern icon, the Southern magnolia (Magnolia grandiflora) ranks with Robert E. Lee and mint juleps. Its 60- to 80-foot height, however, excludes the stately tree from small-space gardens. Don't despair; two smaller Southern magnolia cultivars, "Little Gem" (Magnolia grandiflora "Little Gem") and Teddy Bear (Magnolia grandiflora "Southern Charm"), have inherited their parent's leathery leaves and elegant blooms. 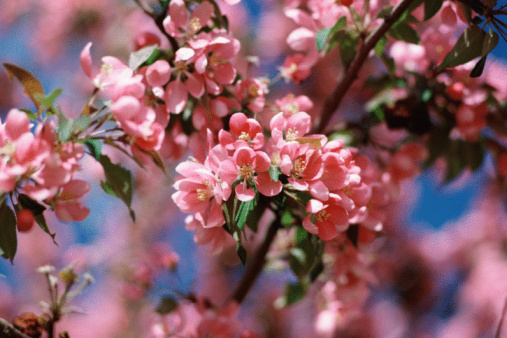 Plant either for abundant, exceptionally fragrant flowers from spring to fall. 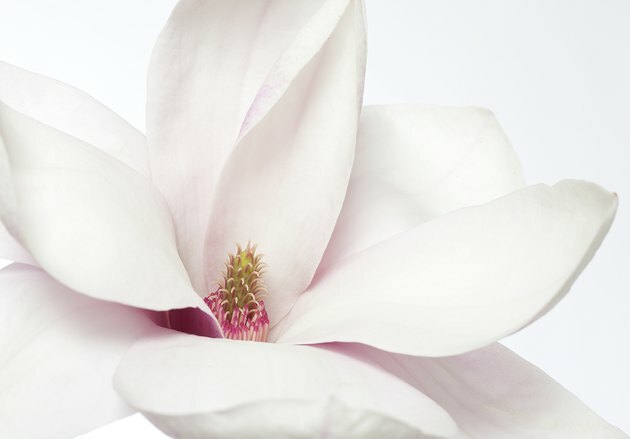 Southern magnolia flowers have a sweet, lemony fragrance. Like the Southern magnolia species tree, Teddy Bear magnolia grows in U. S. Department of Agriculture plant hardiness zone 7 through 9. "Little Gem" tolerates more heat, so it's suitable for USDA zones 7 through 10a. Both cultivars do best with at least six hours of daily sun. Teddy Bear grows in partial shade, but has more compact growth and heavier blooms in sun. As evergreens that retain their leaves through winter, the cultivars need protection from prolonged exposure to sub-freezing temperatures. Planting them near walls or structures with southwestern exposure and watering them well reduces the risk of damage. 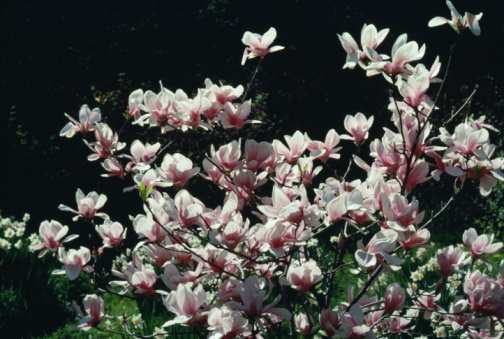 Picture a dense, glossy-leaved Christmas tree, and you have the Teddy Bear magnolia. A mature tree reaches 20 feet tall with a 12-foot spread at its base, gradually tapering to a point at its top. Its upright branches and narrow, conical form work especially well in narrow spaces or containers. "Little Gem" tops out at 35 feet with an oval or pyramidal form and an 8- to 10-foot spread. Use it as a shrub or hedge plant, or prune it as a tree. "Little Gem" and Teddy Bear both have leaves and flowers smaller than Southern magnolia's. Teddy Bear takes its name from the thick, reddish-brown down covering the backs of its oval, 4- to 8-inch green leaves. The undersides of "Little Gem's" 5- to 7-inch, elliptical leaves have a sparser, bronze-brown covering. For the quickest flowers, choose "Little Gem." It blooms in the second or third season after planting with gray and white flowers measuring 4 inches across. Teddy Bear's 6- to 8-inch flowers appear in its third year. Both trees bloom from mid-spring to fall. Their woody, fuzzy seed cones open to reveal bright red seeds. True to their heritage, "Little Gem" and Teddy Bear shed their old leaves in spring and their ripe seed cones in fall. The litter takes a long time to decompose, so be prepared to rake if you don't want the mess. Cleaning up after them is a small price to pay for their year-round beauty and excellent pest and disease resistance. Although smaller than the species tree, both cultivars need plenty of room for root expansion. Plant them at least 10 feet from structures or pavement. "Little Gem" and Teddy Bear like well-draining, loamy soil in the acidic to mildly alkaline range, with a pH reading no higher than 7.7. Once established, both cultivars are moderately drought tolerant and need supplemental water only during extended dry spells. They also accept wet soil for brief periods.